We are excited to be a guest over at the Small + Friendly blog today! 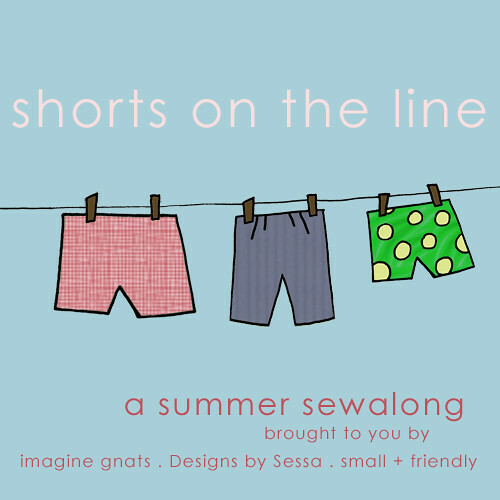 If you are interested in learning a few helpful tips and tricks when sewing tailored shorts (like our Banyan shorts) then please hop on over. Welcome to the first day of the sew along! If you are just now joining us please feel free to jump in at any time! Who knows, maybe you'll learn something new by just reading along? Today we are just going to cut and prepare our work for tomorrow's sewing, but first if you don't mind, I'd like to start by answering one frequently asked question. Why is the pattern printed on both sides? 1. We print our patterns on both sides using recycled newsprint to save paper waste. Less paper also means lighter shipping which means less shipping cost for you! You can trace the pattern using tracing paper, freezer paper or any paper that is translucent. 2. Tracing the pattern allows you to use the pattern over and over again as your daughters or granddaughters grow, and they do grow fast. If you were to cut the pattern you would only get one size out of the pattern and that's not good for anyone. 3. Personal preference. Tissue paper patterns tend to rip easily and the print fades with time. I hope this answers your question, but if you have more, please feel free to email us. For a larger view please click on the photos. The very first thing you should do before anything else (if possible) is measure your child. Every designer and label has their own unique sizing, which means your daughter may measure to be a Figgy's size 3, but for another pattern she may be a 2. You'll find the sizing chart on the back of the pattern cover. When preparing this sew along I noticed a tiny typo in the sizing chart. The Chest measurement for size 2/3 should read 21 - 21.5. We apologize for any confusion. For this blouse you'll want to take a chest and waist measurement. If you have decided to make the long sleeve version, I would also measure from the shoulder to the wrist. What happens if your daughter is between sizes? I always recommend going bigger before going smaller, because tomorrow they'll probably awake .5" taller, and of course their bellies grow after every meal. Gosh, I love it! For this blouse I chose to use a Japanese Lawn cloth by Yuwa because it's one of my favorite fabrics to work with. It will drape well and the fabric hand is perfect for my niece's sensitive skin. A little lesson I learned from Sarai & Caitlin at Colette patterns is using colored pencils to trace. They really are perfect for the job. I use one color to trace the outer main pattern piece and another color for my markings. So here we have traced all the pieces we need for our Ayashe of choice. As you can see I've decided to make the Ayashe with the Mandarin Collar and short sleeves. I am still undecided as to whether or not I'd like the drawstring or elastic at the hem. If you have already chosen to use the bias tape draw string you will need to cut bias tape from the fabric 1.5" x 35". If you have chosen the bias tape tie string collar option you will need to also cut bias tape from the fabric that is 1.5" x 30". Sarai also has one of the best bias tape tutorials I've seen so if you need a little help with the process please visit HERE. You can use weights or pins to keep the pattern from shifting. Normally, I would use weights and my rotary cutter, but the blade broke and I had to use pins and scissors. The reason why I suggest the rotary cutter is with this lightweight of a fabric the pattern pieces can slip easily and the scissors may leave chomp like markings. Before I begin cutting I like to snip out the triangles on the paper. It is important the you never snip in towards the seam allowance when cutting out the fabric pattern pieces. You don't want to accidently snip in too far. Interface one of the collar pieces, this will become the Upper collar. Remember, the "bumpy" side of the interfacing faces the wrong side of the fabric. I use the fabric pattern piece I cut and not the paper piece, because I feel it gives a more accurate cut. All cut and interfaced. I'm ready to go! Notice I put my pattern pieces in a zip lock bag? This is a great way to store your patterns. Just remember to label the bag then file it away. Sew two rows of *gathering stitches between the notches on both the back and the front pieces. To create *gathering stitches you simply increase the stitch length to the longest length. *To gather simply pull both bobbin threads and slide the fabric towards the opposite direction. See you tomorrow when we will stitch up the front and attach the shoulder panels and collar! Happy Sewing! I love a fun sew along. My two favorite parts: all the visual details of the sewing process and the gorgeous results from the sewists. We decided that the "Ayashe" blouse will be the highlight of our first sew along because of all the little details it has to offer. We'll take you through learning how to gather, attach facings, adding elastic or a draw string to the hem and attaching a mandarin color. Need a little inspiration? Have a look at these two adorable Ayashe Blouses that popped up in the flickr group this last week created by Hemoglobin Hummingbird and Daisy Girl. Just a touch of Liberty, perfect! Using Tula Pink, Prince Charming was a terrific fabric choice and her daughter couldn't be any cuter! The sew along will begin on Wednesday, February 8th. Don't worry if you haven't purchased the pattern yet, you still have time! Order by Saturday the 4th and I'll post the pattern priority mail. Visit the Ayashe page for the supplies you'll need to purchase this weekend to get started. Daniela has created two adorable buttons for you to choose from. Feel free to copy and paste this code onto your blog. Email us at info@figgyspatterns.com to let us know you're sewing along and we'll be sure to link your blog at the end of the sew along.